Alzheimer’s is the most common form of dementia and appears in more than 80 percent of dementia cases. It can cause seniors to withdraw from relationships and stop participating in activities that they used to enjoy. To reduce the effects of severe cognitive impairment it is important to keep these relationships intact. For families with a loved one suffering from dementia or Alzheimer’s, it is hard to face an ongoing decline. Even with the best intentions, it’s challenging to know where to start in supporting their loved one’s unique needs. There is good news. You can provide for your loved one’s needs more fully when you incorporate a home care provider as a component of the process. A home care provider will work closely with you and your family to create a customized plan for your loved one. With proper planning and resources, it becomes possible to enable your loved one to get the care he or she needs. In other words, you do not have to do it all on your own. Here are some ways these professionals can help you with engagement and activities for seniors with dementia. A good place to start is with understanding your loved one’s unique needs. By educating you on what your loved one needs at this time, the home care provider can give you the tools and resources you need to provide the best possible outcome. While home care providers are not doctors, they work one-on-one with your loved one on a consistent basis. This means they can shed some light on what is happening and what your senior needs right now. Learning helpful, real-world steps to take can give you some peace of mind and reassurance that you are doing what is right for your loved one. Let’s face it – you are busy with your family. You cannot possibly provide care every minute of every day to your loved one. However, a home care provider certainly can do so. He or she will work closely with your loved one throughout the day – as much time as you would like. By providing this constant level of time and attention, your senior will stay more engaged and more active. Any of the activities for seniors with dementia listed on this page suddenly become more accessible because there is more time to do them, and there is someone to ensure they are being done properly. Creating a customized care plan for your loved one is also important. For example, seniors will benefit from doing things they enjoy now or those things they enjoyed previously. With the help of a home care provider, it’s possible to embrace a wider range of activities for seniors with dementia. More so, the individual can choose activities best suited to your loved one based on their current mental and physical health. Again, experience makes a big difference here. Many of the activities for seniors with dementia are safe to perform. Watching television or playing games together are great low-risk activities. Yet, if you want your loved one to embrace other activities good for their mental and physical health, it becomes necessary to ensure the environment is safe. Things like cooking together or even going for a walk require a professional to be by their side. Again, you can do some of these activities with your loved one, but to do them all day long, you may benefit from hiring a professional to offer some guidance and support. The goal is for your loved one to be engaged, but only in a safe environment. When you are with your loved one, you know the value of talking to them. As Alzheimer’s and dementia worsen, the need to talk becomes important on a whole new level. While talking itself can bring back memories, it also works to help a loved one settle down, remain calm, and feel safe. Even if they do not remember what is happening, they will be able to better embrace life with someone to talk to on a regular and consistent basis. A home care provider can make sure there is always the opportunity for conversation. This can be empowering for you, as a loved one, who cannot always be there. Companionship is one of the most critical activities for seniors with dementia. Having someone in the home or in the room can make a big difference in your loved one’s health. This is important even during the early stages of dementia. It allows for the individual to know they have help available to them, guidance when they need it, and answers to their questions. Keep in mind that one-on-one activities can help your loved one remain healthier longer. Having someone help them read a book or even getting through a bad night can instill confidence and provide reassurance. One of the most important ways a home care provider works for you is to continue your good efforts long term. The activities and lifestyle your loved one is used to can be carried on even when you are not there to help them yourself. It is a combination of these factors that can encourage your loved one to remain comfortable, happy, and supported. Cognitive skills refer to an individual’s mental capability. These capabilities help us process the information we receive from our five senses. Without cognitive skills, we would not be able to talk, think, read or learn. Cognitive skills include awareness, reasoning, perception, intuition, knowledge, and judgment. Although memory loss is mild in the early stages of dementia, these symptoms worsen over time. An individual’s ability to respond to people, surroundings, or carry on conversations becomes affected. We fight this battle by incorporating activities for dementia patients into daily routines. These should be activities the person enjoyed before their diagnosis. Many of these activities focus on cognitive skills and fall into one of two categories–conversation and switching hands. Meaningful conversation is critical for patients with dementia. Asking them for their opinion or advice stimulates the mind and increases their self-worth. To enhance cognitive skills, we change dementia patients everyday activities. It can be something as simple as switching hands while writing, dialing the telephone or brushing teeth. Because every client is unique, meaningful activities will vary from one person to the next. Here are some examples of activities that we incorporate into our custom care plans. 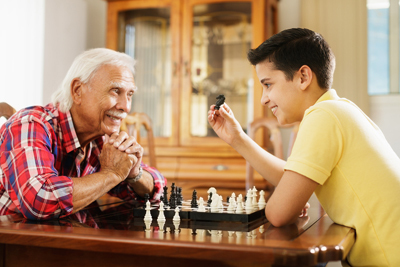 At Georgetown Home Care, we know the importance that games and activities play for those with dementia or Alzheimer’s. We strive to improve our clients’ quality of life and prevent or slow the progression of these conditions. If you or a loved one is in need of home care, contact Georgetown Home Care today and schedule your complimentary assessment.